Arigna Natural Gardens » More planting! 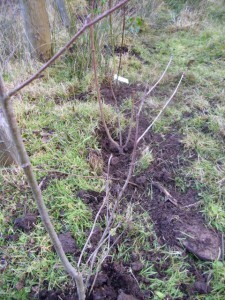 The predicted frost did’nt arrive, at least not here anyway, so planting of bare root trees continues. Our boundary hedges have some gaps which we are filling in with Hazel, Willow, Holly and Guelder Rose. Together with the long established Ash and Hawthorns a nice hedge will be formed. As well as being nice to look at this hedge will provide good shelter from the cold north wind. Electric fencing will have to be used when the goats are in this field as they are very prone to nibbling on hedges! Lovely animals, goats, but they are demons after trees and shrubs. We invested in two electric fences last year so problem solved.